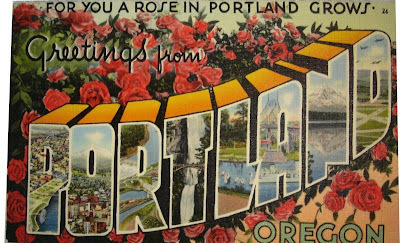 The Centennial year of the Portland Rose Festival has been a chance to look back at how the celebration and the city have changed over time. Billboards, magazines, films and newspapers have featured views of the festival in its many incarnations. As the following pictures show, sometimes it is what is around the edges of a picture that tell a lot about a time and place. Sailors from one of the Rose Festival fleet ships, march across the Morrison Bridge in this picture from the 1961 Rose Festival. (This picture most of the others that follow were purchased from the amazing and chaotic photo file boxes at Really Good Stuff on Hawthorne). The same view, 46 years later. Most of the buildings still existent in the first picture are blocked by newer construction, but the Pacific Building (to the far right in the first picture) can be seen reflected on the glass wall of a much younger neighbor. A close-up shows a cluster of buildings from Portland’s old riverfront downtown on Morrison which survived the 1940’s and 1950s, only to be replaced in later years. The green building was the home of Gevurtz Furniture from 1930 to 1984. Today it is more tastefully attired in its incarnation as the Rock Bottom Brewery. 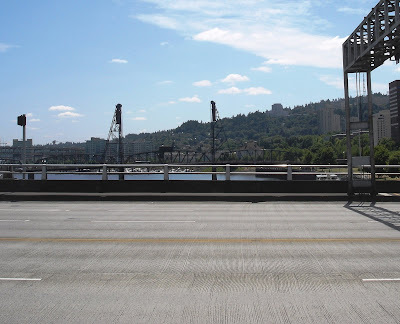 The 7-Up billboard was a long time feature on the west bank of the Willamette. 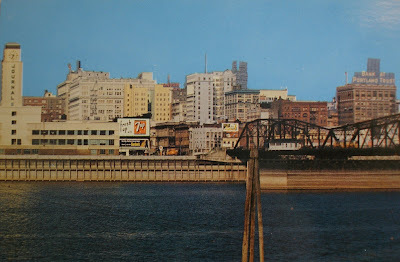 It can also be seen in this pre-1958 post card with the original Morrison Bridge still in place. Another view from the 1961 Rose Festival shows the Olds and King department store’s float in honor of the Air Force Academy. Olds and King (formerly Olds, Wortman & King) had been located at the corner of Tenth and Morrison (today the Galleria Building) since 1910. In 1961 Olds & King was in twilight, having been sold that year to the Rhodes department store chain which would retire the Olds and King name. Liberty House-Rhodes closed the store in 1973. Behind the bridge can be seen the Oregon Journal Headquarters (the former Public Market building) which would be torn down in seven years later to create Harbor Drive (now the location of Tom McCall Waterfront Park). 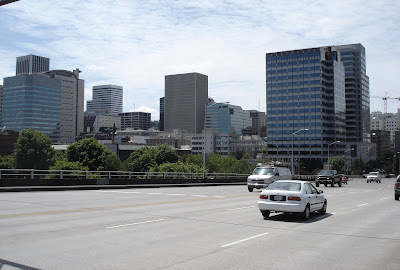 South from the Morrison Bridge, towards the Hawthorne Bridge, June 2007. Salem represents with a Native American themed float past the Washington Service Garage (still existent) and the long vanished Drake Hotel. The parade route likely started at Civic Stadium. 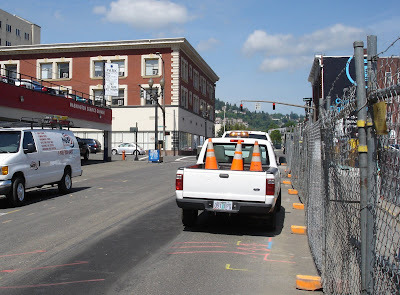 The trench for I- 405, a block to the west had not yet been dug. SW Thirteenth and Washington with the Washington Service Garage, June 2007. Queen Patricia Bentley and Prime Minister Craig Evans pass the Washington Building in 1961. The titles are a mystery. Patricia Bentely does not appear on the list of Rose Festival queens. As for the Prime Minister, Rosaria is a monarchy. 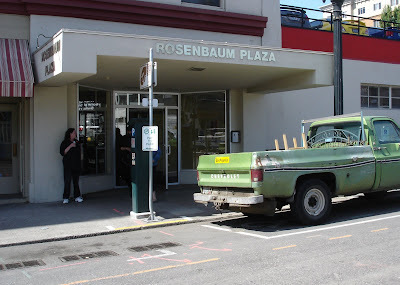 The Washington Building exists today as the Rosenbaum Plaza. Beaverton on the New Frontier! The Beaverton Area JC celebrates the space race with a Cape Canaveral float. Sun 'n' fun, rolling dice! The Los Vegas float and a food vendor, 1961. The floats of 1970 were larger and more extravagant than their predecessors a decade earlier. Toyota makes a pre-energy crisis appearance, very much as a Japanese company. The Confederate battle flag in the crowd to the left is an odd accoutrement. The truly impressive Olympia Brewing float of 1970. What is also interesting, in light of recent headlines, is what does not appear in the picture- there is no duct tape! In fact, in the over 40 pictures I purchased from Really Good Stuff, from the years 1955, 1961, 1970 and 1972, there is no sign of duct taped pavement to mark seat claims. This begs the question (a few actually). When did duct-taping start? When was that fateful moment the first homesteader marked a claim? And where? And once it happened, how long did it take to spread? Which Rose Festival parade was the last one without duct-tape? In this picture from the 1955 Rose Festival parade, Smokey the Bear implores all to Keep Oregon & Washington green. 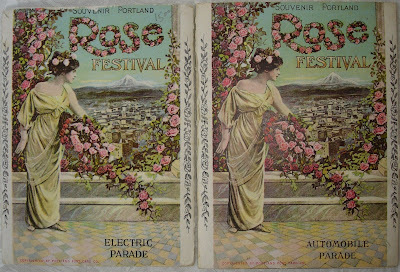 The Centennial year of the Rose Festival focuses on nostalgia, but early festival parades looked forward. There were at least two “Electric Parades” with the floats riding on streetcar trucks, the height of early twentieth century technology. Then in 1913, the parade was billed as the Automobile Parade, heralding a new age. The two brochures above, from 1912 and 1913 reflect the shift. I could be really wrong on this..but I believe the question about the queen and prime minister I can shed some light on. It looks like she was the junior queen and there would have been a junior prince (which became prime minister at some point) that was a boy. There was in fact a whole junior court. My husbands aunt was actually one of the junior princesses. I didn't start seeing duct tape until the late 90's. Before that, you wanted the spot, you SAT in it all night.